The pavilion will offer workshops, orientations and room to socialize while charging electronic equipment, says Annette Rodríguez, MMM’s VP of corporate communications. 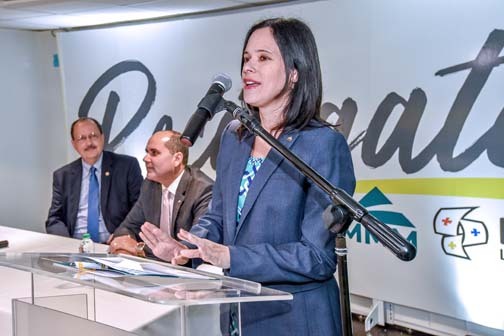 MMM Healthcare and Plaza Las Américas unveiled Tuesday a new space meant to “energize” mall patrons in the wake of Hurricane María, as part of a philosophy that says that a health plan must offer integrated physical, mental and emotional health care. The pavilion, which will provide charging stations for technological equipment, is located on the mall’s first floor in front of Playero and close to Sears . We activated our clinical resources and our volunteer groups to carry medical assistance, to provide clinics, food, water and education on prevention to the island,” he said. “However, in times like this, our population of seniors need more because they are part of a population that is very vulnerable, that is why being sensitive towards their needs is so important. This special pavilion responds to these needs,” González said, adding that Puerto Rico resident are facing very particular health needs, prevention of diseases, drugs and health care management. “They also face the need to have a space of leisure in a centric and safe place to recharge energy, both physical and emotional, with simple things such as having a signal to connect and a place to charge their cell phones,” González noted. The space will offer a varied program of activities that will address the different needs of visitors, while providing integrated healthcare to promote, among visitors, the great feeling of having good health. A group of professionals will offer lectures on nutrition, sensitivity, safety, Medicare benefits, interpersonal relationships and motivations, among other topics. Workshops, exercises, table games, Bohemian music and concerts, will be offered. The pavilion also has stations for charging electronic devices, WiFi service and will serve as a meeting point for socialization, not only the population 65+ attending MMM workshops, but for all those who need to refuel emotionally, and need to charge their cell phones, the insurer said. Hey Buddy!, I found this information for you: "MMM, Plaza Las Américas unveil ‘Recharge! With MMM & Plaza’ pavilion". Here is the website link: https://newsismybusiness.com/americas-recharge-pavilion/. Thank you.